Henry Hazlitt wrote this book following his stint at the New York Times as an editorialist. His hope was to reduce the whole teaching of economics to a few principles and explain them in ways that people would never forget. It worked. He relied on some stories by Bastiat and his own impeccable capacity for logical thinking and crystal-clear prose. He was writing under the influence of Mises himself, of course, but he brought his own special gifts to the project. As just one example, this is the book that made the idea of the "broken window fallacy" so famous. Concise and instructive, it is also deceptively prescient and far-reaching in its efforts to dissemble economic fallacies that are so prevalent they have almost become a new orthodoxy. This is the book to send to reporters, politicians, pastors, political activists, teachers, or anyone else who needs to know. It is probably the most important economics book ever written in the sense that it offers the greatest hope to educating everyone about the meaning of the science. Many writers have attempted to beat this book as an introduction, but have never succeeded. Hazlitt's book remains the best. It's still the quickest way to learn how to think like an economist. And this is why it has been used in the best classrooms for more than sixty years. If you know someone who is interested even SLIGHTLY in economics, give them this first. It's so beautifully written, the logic literally brought tears to my eyes the first time I read it. Hazlitt was truly a man of genius. from USA The Book Every American Must Read! At the Mises Institute, the shining beacon for free market economics, many members trace their conversion to (or, at least, their interest in) the free market economy to a single book. 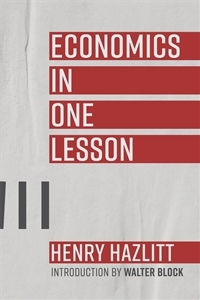 Though I read Henry Hazlitt’s masterpiece (Economics in One Lesson) later in my economic studies than some, I found it to be a definitive work.It teaches plainly the principles of free market economics more simply and concisely than any other I have found. I recommend that anyone seeking to understand economics read this book. If we're going to have public schools, this should be required reading! What a great, yet simple book. It focuses a lot of attention on what Bastiat referred to as "seen" and the "unseen" consequences of economic actions... a concept most of the sheeple can't seem to grasp. This book is the most important one I've ever read. It's profound how well it works as a gateway to an entirely new philosophy. However, I hesitate to give this a 5 because the back page of this edition acknowledges the book as it is - a scathing critique of "left-liberalism." Obviously I have no problem with that ideal now. Once upon a time, though, I had been the kind of liberal who would have been turned off by that description; thankfully, I found it first in an older edition! I think it's important not to alienate those that could benefit most from reading this incredible book. Perhaps just an idea to keep in mind for a future edition. "Enough to Buy Back the Product"
The One Lesson is even printed on the back. This really ought to be considered a classic. It was published first in 1956, and had a massive impact in Latin America. A lone voice of economic sanity in the U.S. after World War II was Henry Hazlitt.